In this ebook you get 5 file folder games to help practice basic skills that are essential for the first grade. Read below to learn more about each file-folder game in the collection. Skip Counting is when you count by any number other than 1. In this file folder game students will be able to practice skip counting by 2's, 3's, 5's, and 10's. Skip counting is an important skill to start learning multiplication facts. This game provides a fun reinforcing way to practice these important skills. In this game a family of dragons wants to go visit the princess in a nearby castle. Some of the dragons can fly longer distances than others. The distance that each dragon can fly is the number that is on their game piece. 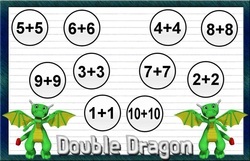 Students need to skip count by that number and place counters on each spot where their dragon needs to land. When they've placed all of the counters the dragon is ready to make their journey. The student should say each number as the dragon lands on the space. Dragon has found a treasure chest full of gold. Help him count his gold by putting the numbers in order. Then sort the gold into the even and odd caves. This file folder game is perfect for practicing even and odd numbers. In this file folder game students need to match the answer to the correct doubles fact. Do your student confuse the addition and subtraction signs. In this file-folder game your students can practice choosing which sign to use. How many dragons can fit in a wagon? This file folder game lets kids search for rhyming words. 1. Deal 7 cards to each player. 2. At the beginning of each turn a player draws enough cards to get 7 cards in their hand. Next they put any matching pair of rhyming words in their wagon. If they can't make a pair they can ask another player to switch up to 3 cards. After a switch a player needs to wait until their next turn to put down any matches. 3. When someone gets the "dragon-wagon" matching pair the game is over. 4. 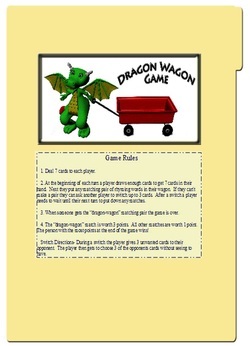 The "dragon-wagon" match is worth 3 points. All other matches are worth 1 point. The person with the most points at the end of the game wins! Switch Directions- During a switch the player gives 3 unwanted cards to their opponent. The player then gets to choose 3 of the opponents cards without seeing the front of the cards.